Spectacular Panoramic Mountain Views surround this Fabulous Old World Tuscan home in Troon Ridge Estates on 3.34 acres. 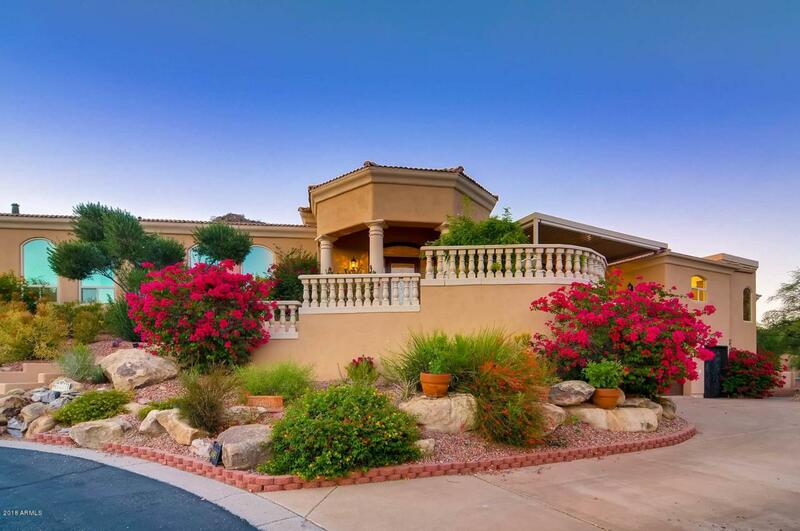 Located on a hill top with southwestern orientation and elevated views of sunsets and mountains. Generous living areas that include formal dining room, living-room, Breakfast room, wet bar, granite countertops, travertine floors as well as hardwood floors, large kitchen island with groceries elevator, The basement has separate entrance with a one bedroom, one bathroom and private living area. The home has a total of 4 master suites with 3.5 bath all with private entrance to back yard and a huge balcony that capture stunning sunsets. Enjoy the heated pool with water falls, and spa, incredible patio with outdoor BBQ and kiva fireplace. Cross Street Happy Valley And 112 Th Pl. Hoa Name Troon Ridge Est.